I’ve done this several times, and in this season of grilling, it is an absolute winner. Here’s the recipe, It’s simple and elegant (so to speak), and the end result tastes great. Pop the tab off the beer can. Pour half of the beer (3/4cup) over the soaking wood chips or chunks, or reserve for another use. If cooking the chicken on the can, using a church key-style can opener, make 2 additional holes in its top. Set the can of beer aside. Remove the packet of giblets from the body cavity of the chicken and set aside for another use. Remove and discard fat just inside the body and neck cavities. Rinse the chicken, inside and out, under cold running water and then drain and blot dry, inside and out, with paper towels. Sprinkle 1 teaspoon of rub inside the body cavity and 1/2 teaspoon inside the neck cavity of the chicken. Drizzle the oil over the outside of the bird and rub or brush it all over the skin. Sprinkle the outside of the bird with 1 tablespoon of rub and rub it all over the skin. Spoon the remaining 1 1/2 teaspoons of rub into the beer through a hole in the top of the can. Do not worry if the beer foams up: This is normal. 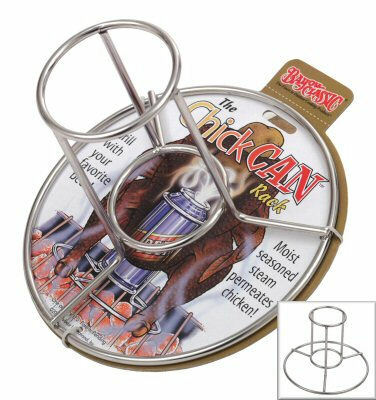 If cooking on a can: Hold the bird upright, with the opening of the body cavity at the bottom, and lower it onto the beer can so the can fits into the cavity. Pull the chicken legs forward to form a sort of tripod, so the bird stands upright. The rear leg of the tripod is the beer can. If cooking on a roaster: fill it with the beer mixture and position the chicken on top, following the manufacturers instructions. Tuck the tips of the wings behind the chickens back. Set up the grill for indirect grilling and preheat to medium. If using a charcoal grill, place a large drip pan in the center. If using a gas grill, place all the wood chips or chunks in the smoker box or in a smoker pouch and preheat on high until you see smoke, then reduce the heat to medium. When ready to cook, if using a charcoal grill, toss all of the wood chips or chunks on the coals. Stand the chicken up in the center of the hot grate, over the drip pan and away from the heat. Cover the grill and cook the chicken until the skin is a dark golden brown and very crisp and the meat is cooked through (about 180 degrees Fahrenheit on an instant-read thermometer inserted in the thickest part of a thigh, but not touching the bone), 1 1/4 to 1 1/2 hours. If using a charcoal grill, you will need to add 12 fresh coals per side after 1 hour. If the chicken skin starts to brown too much, loosely tent the bird with aluminum foil. If cooking on a can: Using tongs, hold the bird by the can and carefully transfer it in an upright position to a platter. 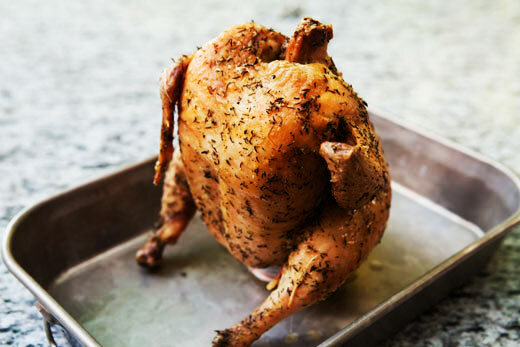 If cooking on a roaster: Use oven mitts or pot holders to remove the bird from the grill while it is still on the vertical roaster. Present the bird to your guests. Let the chicken rest for 5 minutes, then carefully lift it off its support. Take care not to spill the hot beer or otherwise burn yourself. Halve, quarter, or carve the chicken and serve.